Probably no issue during the most recent financial crisis aroused more passion than financial institution bailouts. 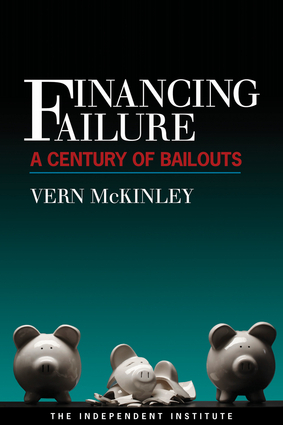 Focusing on the policymaking behind the decisions to bail out these institutions—not just during the most recent crisis, but also throughout history—this account argues that the genesis of financial crisis lies in government policy, whether in the mismanagement of monetary policy during the 1930s or in the extraordinary push of consumers into homeownership leading up to the current crisis. This detailed analysis is an essential read in order to understand why the United States has become so reliant on such interventions. Vern McKinley has more than 25 years of experience as a consultant, an attorney, a financial analyst, and a policy analyst. He has been a legal advisor and regulatory policy expert for central banks and financial agencies, including the Asian Development Bank, the International Monetary Fund, the U.S. Treasury, and the World Bank. He has also contributed a chapter to Central Bank Modernization and has contributed articles to various national and international publications, such as Regulation magazine, USA Today magazine, and the Washington Times. He lives in Ashburn, Virginia.